I’ve posted on here before about my father. But not much about my mother. We had a complicated relationship. She was a bitter, unhappy woman. She loved me, but I don’t think she felt fulfilled being a mother. She grew up in a time and place where that’s what was expected of her, but she wanted, needed, more. She was very smart, but undereducated. One of the things I loved best about my father was how he saw my mother. He recognized how bright, talented and creative she was. He believed in her. I’ve been watching Baskets. The best thing about it is Louie Anderson playing Zach Galafinakis’ mom, Christine. At first I was annoyed by the casting, Bechdel test and all. 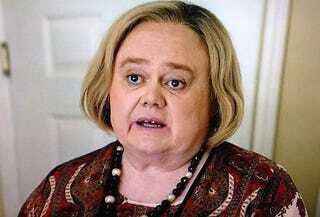 But Louie Anderson is so amazing in this role I can’t see anyone else playing her. It’s not a joke, not stunt casting. Anderson has said he based the character on his own mother. It’s so poignant, and for me, heartbreaking. Because I see my mother in Christine. She was a large woman in a family of tiny, beautiful, sisters and cousins. They treated her badly. Just like Christine’s friends on Baskets. And my mother, like Christine, pretended not to notice. She tried to do better, be better, earn their respect. But she didn’t. And instead of telling them how much it hurt, she told us. How horrible people were, not to trust anyone, how we’d never be accepted. All while pushing us to fit in, achieve the status she never did. It was confusing to say the least. And painful. And I resented her. I was wild and rebellious. I refused to be her mark in the world, sabotaging making my own mark in defiance. I blamed her for my feelings of inadequacy. Tonight I watched this week’s episode of Baskets. And Christine says to Chip (Zach Galafanakis) ,”you should have had my back”. And I burst into tears. Because I should have had her back. And I didn’t. Everyone, except my father, let her down. And that includes me. That’s how powerful Louie Anderson is on this show. Each episode is like therapy. I wish I could tell Mr. Anderson how important it is to me. If you haven’t watched it, give it a chance. If you tried and didn’t like it, try again. It gets better each season.